Shou Oota is a sixth grader who loves soccer. He isn’t really good, but he doesn’t care, all he wants to do is play the game. Unfortunately for Shou, his grade team at the Momotaro Predators has just been disbanded. But Shou doesn’t want to give up and goes in search for new team members. 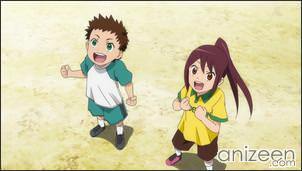 During his search he finds out a girl, Erika Takatou, in the near park playing with her dog, and to the eyes of Shou, she is really fast with her ball dribble. Shou can’t contain any longer and asks her if he can join her practice. Erika just moved to this area and has been playing before back in Osaka. Now, she wants to join a good team, but meanwhile, she is just playing around. 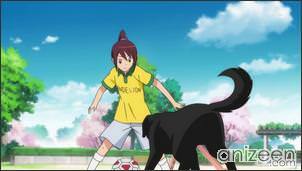 She accepts to play with Shou is he can take the ball from her dog, which has a natural instinct for football. Anyway, Shou struggles a lot and barely can keep after the dog, but in the end he is able to steal a ball and gains a little respect from Erika. 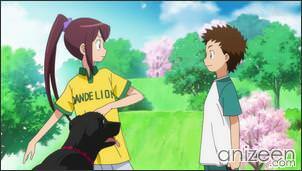 Shou enjoys the evening and asks Erika if she wants to join his team. 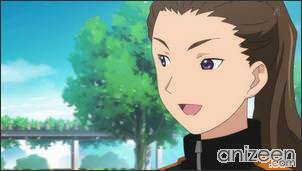 She agrees to come watch a practice, but Shou remembers that his team has been disbanded. 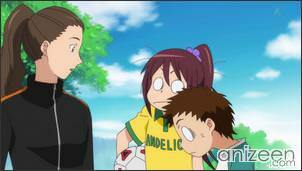 The next day, both kids go to watch the soccer practice, just to find out a negative answer from the manager. Even more, he tells the, that they don’t have a coach and that girls are not good playing the game. Erika really gets mad and parts ways, Shou apologizes with her because of the misunderstanding and tells her that he thinks she is really good. With that said, Erika warns Shou that they will practice a lot that day. In the park, they see a young woman training, she is serious and actually, she is a professional soccer player. Erika recognizes her as Misaki Shimizu, one of Japan’s best players, who suffered an injury before the 2011 Women’s World Cup. 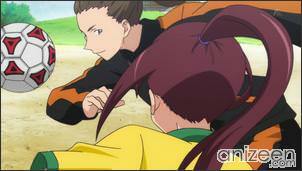 As usual on Shou, he runs to Misaki and asks her if they can play together. To Erika’s surprise, Misaki agrees and tell them that her health is great now. 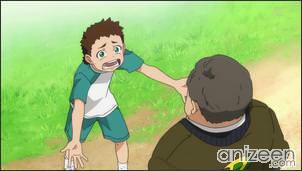 But Shou goes a bit further and asks Misaki if he can ask her something if they are able to win in the game. Intrigued, Misaki tell them that it’s alright. While playing, Erika learns that women can be great players as well and that there is room for her to improve if she doesn’t give up. But challenging a professional is not easy and both kids are exhausted. 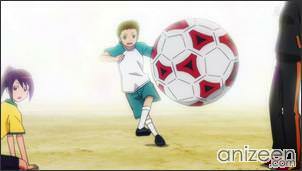 Finally, Shou concentrates and learns Misaki’s tendencies, and in the final moment, he is able to steal the ball and score. Misaki is quite amazed, because she was serious about the game. After that, Shou asks her to be their new team coach, knowing that a renowned player like her would attract back players to the Predators. 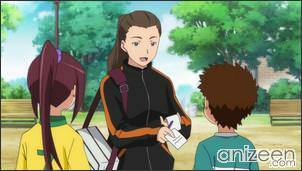 Unfortunately, Misaki is a professional and can’t spend time coaching. But she tells the kids that fate is amazing and that she is sure they will find a great coach, after all, they met by chance and good fortune that day. Shou Oota is a sixth grader, and in the beginning, he is the last remaining member of the Momoyama Predators and because of that the Manager disbands the team. 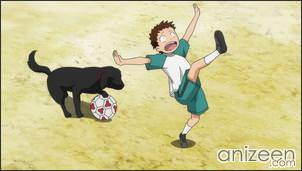 Shou loves soccer, even though he is pretty bad at it. Despite all that, he goes off to try to find members to revive the team. First he meets Erika and her dog practicing soccer in the park and immediately asks her to join. Shou is very strong-willed and loud, and though his soccer skills aren’t so good in the beginning he gets better over time. His greatest asset is his ability to never take his eye off the ball and to see the patterns in the way players move. 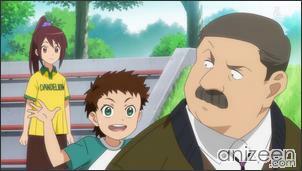 Erika Takatou is a sixth-grader originally from Osaka and is the former ace of the Namba Dandelions. Back then, she was known as the Speed Star due to her speed with the ball. It appears as though her team was also disbanded and she transferred to Shou’s school. She has a bit of a complex about boys, saying that they are better than her because she is a girl and in several instances is deeply hurt and angered by it. Ginga e Kickoff!! (銀河へキックオフ!!) 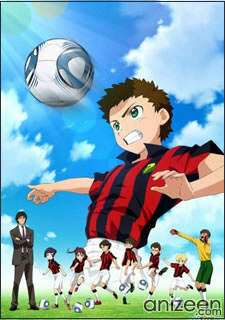 is a sports anime about a soccer team, Momoyama Predators, formed by elementary school students. 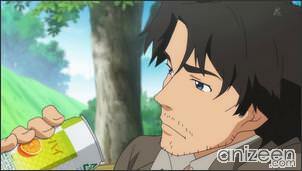 It started its run on NHK General TV on April 7, 2012.